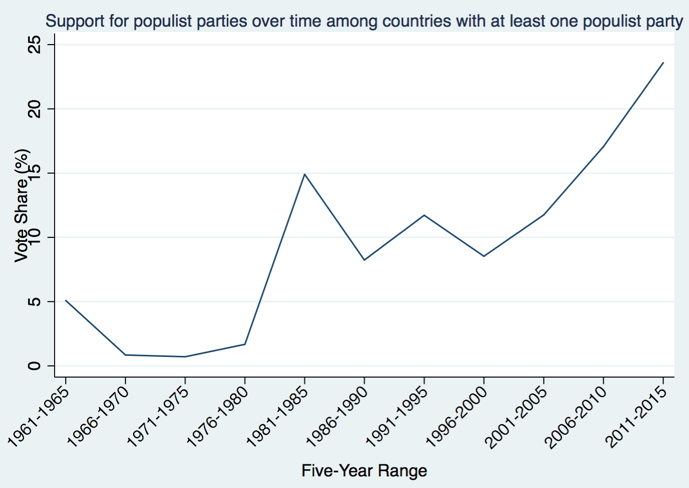 Populism appears to be a recent phenomenon, but it has been on the rise for quite some time (Figure 1). Despite recent setbacks in the polls in the Netherlands and France, it is doubtful that populism will be going away. The world’s economic-political order appears to be at an inflection point, with its future direction hanging very much in balance. Notes: See Rodrik (2017) for sources and methods. ‘Populism’ is a loose label that encompasses a diverse set of movements. The term originates from the late 19th century, when a coalition of farmers, workers, and miners in the US rallied against the Gold Standard and the Northeastern banking and finance establishment. Latin America has a long tradition of populism going back to the 1930s, and exemplified by Peronism. Today populism spans a wide gamut of political movements, including anti-euro and anti-immigrant parties in Europe, Syriza and Podemos in Greece and Spain, Trump’s anti-trade nativism in the US, the economic populism of Chavez in Latin America, and many others in between. What all these share is an anti-establishment orientation, a claim to speak for the people against the elites, opposition to liberal economics and globalisation, and often (but not always) a penchant for authoritarian governance. The populist backlash may have been a surprise to many, but it really should not have been in light of economic history and economic theory. To anyone familiar with the basic economics of trade and financial integration, the politically contentious nature of globalisation should not be a surprise. The workhorse models with which international economists work tend to have strong redistributive implications. One of the most remarkable theorems in economics is the Stolper-Samuelson theorem, which generates very sharp distributional implications from opening up to trade. Specifically, in a model with two goods and two factors of production, with full inter-sectoral mobility of the factors, owners of one of the two factors are made necessarily worse off with the opening to trade. The factor which is used intensively in the importable good must experience a decline in its real earnings. The Stolper-Samuelson theorem assumes very specific conditions. But there is one Stolper-Samuelson-like result that is extremely general, and which can be stated as follows. Under competitive conditions, as long as the importable good(s) continue to be produced at home – that is, ruling out complete specialisation – there is always at least one factor of production that is rendered worse off by the liberalisation of trade. In other words, trade generically produces losers. Redistribution is the flip side of the gains from trade; no pain, no gain. Economic theory has an additional implication, which is less well recognised. In relative terms, the redistributive effects of liberalisation get larger and tend to swamp the net gains as the trade barriers in question become smaller. The ratio of redistribution to net gains rises as trade liberalisation tackles progressively lower barriers. The logic is simple. Consider the denominator of this ratio first. It is a standard result in public finance that the efficiency cost of a tax increases with the square of the tax rate. Since an import tariff is a tax on imports, the same convexity applies to tariffs as well. Small tariffs have very small distorting effects; large tariffs have very large negative effects. Correspondingly, the efficiency gains of trade liberalisation become progressively smaller as the barriers get lower. The redistributive effects, on the other hand, are roughly linear with respect to price changes and are invariant, at the margin, to the magnitude of the barriers. Putting these two facts together, we have the result just stated, namely that the losses incurred by adversely affected groups per dollar of efficiency gain are higher the lower the barrier that is removed. Evidence is in line with these theoretical expectations. For example, in the case of NAFTA, Hakobyan and McLaren (2016) have found very large adverse effects for an “important minority” of US workers, while Caliendo and Parro (2015) estimate that the overall gains to the US economy from the agreement were minute (a “welfare” gain of 0.08%). In principle, the gains from trade can be redistributed to compensate the losers and ensure no identifiable group is left behind. Trade openness has been greatly facilitated in Europe by the creation of welfare states. But the US, which became a truly open economy relatively late, did not move in the same direction. This may account for why imports from specific trade partners such as China or Mexico are so much more contentious in the US. Economists understand that trade causes job displacement and income losses for some groups. But they have a harder time making sense of why trade gets picked on so much by populists both on the right and the left. After all, imports are only one source of churn in labour markets, and typically not even the most important source. What is it that renders trade so much more salient politically? Perhaps trade is a convenient scapegoat. But there is another, deeper issue that renders redistribution caused by trade more contentious than other forms of competition or technological change. Sometimes international trade involves types of competition that are ruled out at home because they violate widely held domestic norms or social understandings. When such “blocked exchanges” (Walzer 1983) are enabled through trade they raise difficult questions of distributive justice. What arouses popular opposition is not inequality per se, but perceived unfairness. Financial globalisation is in principle similar to trade insofar as it generates overall economic benefits. Nevertheless, the economics profession’s current views on financial globalisation can be best described as ambivalent. Most of the scepticism is directed at short-term financial flows, which are associated with financial crises and other excesses. Long-term flows and direct foreign investment in particular are generally still viewed favourably. Direct foreign investment tends to be more stable and growth-promoting. But there is evidence that it has produced shifts in taxation and bargaining power that are adverse to labour. The boom-and-bust cycle associated with capital inflows has long been familiar to developing nations. Prior to the Global Crisis, there was a presumption that such problems were largely the province of poorer countries. Advanced economies, with their better institutions and regulation, would be insulated from financial crises induced by financial globalisation. It did not quite turn out that way. In the US, the housing bubble, excessive risk-taking, and over-leveraging during the years leading up to the crisis were amplified by capital inflows from the rest of the world. In the Eurozone, financial integration, on a regional scale, played an even larger role. Credit booms fostered by interest-rate convergence would eventually turn into bust and sustained economic collapses in Greece, Spain, Portugal, and Ireland once credit dried up in the immediate aftermath of the crisis in the US. Financial globalisation appears to have produced adverse distributional impacts within countries as well, in part through its effect on incidence and severity of financial crises. Most noteworthy is the recent analysis by Furceri et al. (2017) that looks at 224 episodes of capital account liberalisation. They find that capital-account liberalisation leads to statistically significant and long-lasting declines in the labour share of income and corresponding increases in the Gini coefficient of income inequality and in the shares of top 1%, 5%, and 10% of income. Further, capital mobility shifts both the tax burden and the burden of economic shocks onto the immobile factor, labour. The populist backlash may have been predictable, but the specific form it took was less so. Populism comes in different versions. It is useful to distinguish between left-wing and right-wing variants of populism, which differ with respect to the societal cleavages that populist politicians highlight and render salient. The US progressive movement and most Latin American populism took a left-wing form. Donald Trump and European populism today represent, with some instructive exceptions, the right-wing variant (Figure 2). 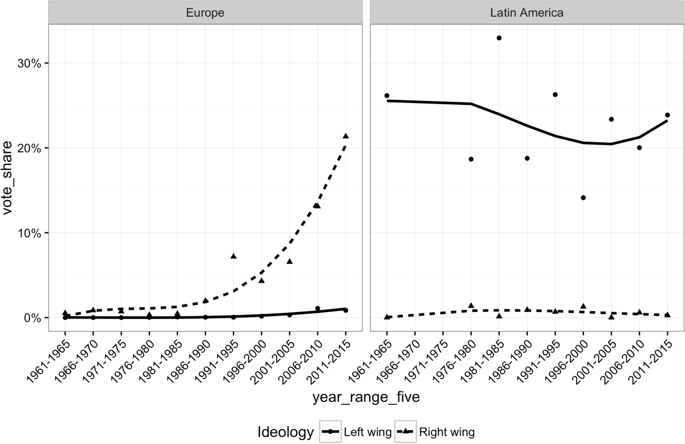 What accounts for the emergence of right-wing versus left-wing variants of opposition to globalization? It is important to distinguish between the demand and supply sides of the rise in populism. The economic anxiety and distributional struggles exacerbated by globalisation generate a base for populism, but do not necessarily determine its political orientation. The relative salience of available cleavages and the narratives provided by populist leaders are what provides direction and content to the grievances. Overlooking this distinction can obscure the respective roles of economic and cultural factors in driving populist politics. Finally, it is important to emphasise that globalization has not been the only force at play -- nor necessarily even the most important one. Changes in technology, rise of winner-take-all markets, erosion of labour market protections, and decline of norms restricting pay differentials all have played their part. These developments are not entirely independent from globalisation, insofar as they both fostered globalization and were reinforced by it. But neither can they be reduced to it. Nevertheless, economic history and economic theory both give us strong reasons to believe that advanced stages of globalisation are prone to populist backlash. Caliendo, L, and F Parro (2015), “Estimates of the Trade and Welfare Effects of NAFTA,” Review of Economic Studies, 82: 1–44. Furceri, D, P Loungani and J D Ostry (2017), “The Aggregate and Distributional Effects of Financial Globalization,” unpublished paper, IMF, June. Hakobyan, S, and J McLaren (2016), “Looking for Local Labor Market Effects of NAFTA,” Review of Economics and Statistics, 98(4): 728–741. Rodrik, D (2017), “Populism and the Economics of Globalization”, CEPR Discussion Paper No. 12119. Walzer, M (1983), Spheres of Justice: A Defence of Pluralism and Equality, Martin Robertson: Oxford.